“Deadhorse” is quick to point that out, and almost as quick to turn the very idea of reality on its head. Written by Eric Grissom and featuring art by Phil Sloan and colors by David Halvorson, this is the story of an unlikely hero tasked–possibly from beyond the grave–with protecting a pilfered key. William Pike is a socially-inept recluse on a mission of discovery, armed only with a key and a note from the father he’s believed dead for decades. An Alaskan bus route unites the reluctant Pike with teenage runaway Elise and awkward science fiction fanboy Edgar. Pursued by an aspiring assassin called The Sasquatch, the peculiar but effective team searches The Trapper’s Keep for Dr. Andrew Conroy and answers about the town of Dead Horse. Meanwhile, the mysterious Gadsworth Company will stop at nothing to retrieve Pike’s key; Charles Gadsworth is both determined to prevent Pike from unlocking the secrets of his mystical ghost town, and keen to use the key on a mysterious strongbox of great power. Collecting the first six installments in a larger tale, “Dead Birds” is a countdown to calamity (or the prevention of one). Will Pike discover the truth about the box and the town built to house it? Will he discover the truth about his father? And what does Handsome and the Doctor have to do with it all? Grissom, Sloan, and Halvorson have crafted a story of surreal wonder, melding science with supernatural and mystery with adventure. It challenges physics and lampoons pop culture with a deft hand; at one point I laughed so hard I almost shot coffee out my nose. While the story is engaging, the true beauty of “Deadhorse” is in the details–a lonely child imagining he’s an airplane, Van Halen mugs, hand puppets, nods to Hamlet, and a juggernaut Sasquatch who’s just waiting for his big break. The dialogue is crisp, the artwork is rich with style and easter eggs, and the story keeps a good pace without sacrificing character depth. 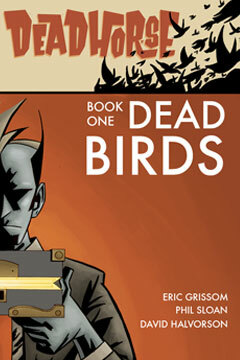 “Deadhorse Book One: Dead Birds” is already available for digital download through iTunes and Amazon, and for trade paperback preorder via Storenvy (Its official release date is March 30th, and purchase of the hardcopy includes a PDF as well). If you’re a New Jersey native I bet you can also pick up a copy at everyone’s favorite* televised comic shop, Jay and Silent Bob’s Secret Stash. *I haven’t been to Red Bank since high school. Your mileage may vary.